Intervertebral disc (IVD) degeneration (IDD) is associated with low back pain and significantly affects the patient’s quality of life. Degeneration of the IVD alters disk height and the mechanics of the spine, leading to chronic segmental spinal instability. The pathophysiology of IVD disease is still not well understood. 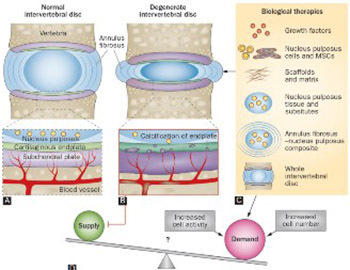 Current therapies for IDD include conservative and invasive approaches, but none of those treatments are able to restore the disc structure and function. Recently, tissue engineering techniques emerged as a possible approach to treat IDD, by replacing a damaged IVD with scaffolds and appropriate cells. Advances in manufacturing techniques, material processing and development, surface functionalization, drug delivery systems and cell incorporation furthered the development of tissue engineering therapies. In this review, biomaterial scaffolds and cell-based therapies for IVD regeneration are briefly discussed.